wander through space and peace we knew"
"Dream" (9:33) concluded the album much like the quiet parts of Floyd's "Careful With That Axe, Eugene" and "Quicksilver". 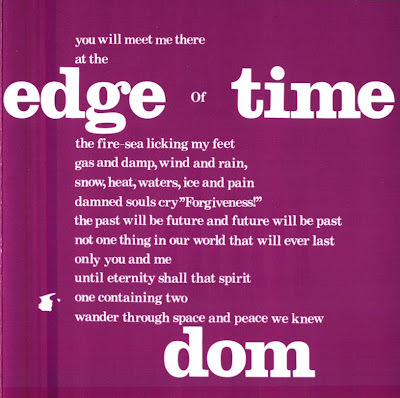 Edge Of Time is unreservedly recommended for all fans of the early Pink Floyd (ca. 1968-69) and Tangerine Dream (ca. 1971-75) style, but I'm afraid it's hard to find. By the way, "Dom" was the groups reference name for an acid trip that lasted for two days.